You will have recently read that the US charity SavingSpecies helped REGUA acquire a parcel of land. Once planted with trees this will be an important corridor linking two established forests. We recently received students from Duke University in USA. 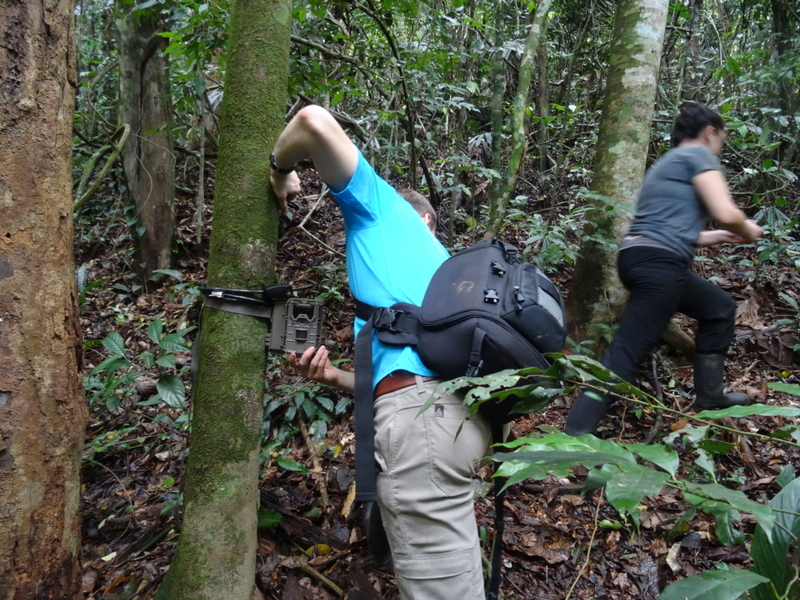 The three students; Bridgette Keane, Chiara Klein and Jacob Levine set up camera traps in both remnant forest blocks to record the fauna present. In time, and once the replanting programme has been completed in the new plot, there will be comparisons with what is using the “new” corridor. They also planned to take panorama images with the famous ‘Gigapan’ system, a system developed for taking many high resolution photos and stitching them together to make a massive panorama photo. Having set up their project, these delightful students left us to go onto the Golden Lion Tamarin project. After three days REGUA’s bird guide, Adilei and I collected the video material to see what was moving in these patches of forest. The results were startling for we recorded a Cracid; Rusty-margined Guan (Penelope superciliaris), the less common Grey-fronted Dove (Leptotila rufaxilla) and White-tipped Dove (Leptotila verreauxi). The mammals were brilliant with a tail(!) of Brazilian Squirrel (Sciurus aestuans), several Agoutis (Dasyprocta leporina), and Common Opossum (Didelphis marsupialis). To top it all Crab-eating Raccoon (Procyon cancrivorus) was also captured on film. These species are using the forest to forage, which is great for seed dispersal and helps the nutrient cycle. Most Neotropical mammals are nocturnal, and the use of camera traps helps us understand which animals are present in these forests. We are really impressed that these species appear to be quite common in this fragment border and this is the required base line information for us to monitor the forest corridor once it is planted. It is with pleasure and excitement that we reach the end of this year having achieved so much progress, with the reserve expanding to 11,000 hectares, reaching 500,000 trees planted, receiving close to 1,000 students on courses, over 3,000 children visiting, and a bumper number of enthusiastic visitors from around the world. You have all contributed to make this a successful model of conservation management. Raquel and I wish to do even more and we have a clear vision of what REGUA needs to reach the greater heights of sustainability. So, please continue to encourage your friends to visit and tell them what a remarkable project this is and keep following us through website and social media. We want to show that our planet needs care and that REGUA is making its contribution. Click on the link for a full report on 2018 at REGUA. All the very best, a Happy Christmas and we wish all of you a healthy, happy and successful 2019. Climate change is predicted to increase the intensity of extreme climatic events such as severe droughts. Little is known on how freshwater ecosystems respond to severe droughts in the neotropics. 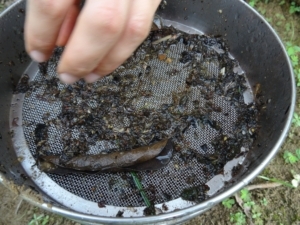 Terrestrial organic matter, primarily derived from plant litter, represents an important food resource in these nutrient limited freshwater ecosystems. The PhD project currently being undertaken by Camille Bonhomme from Universidade Federal do Rio de Janeiro (UFRJ) wants to investigate the effects of quantity of terrestrial matter subsidies on the response of the recipient aquatic communities to drought stress. 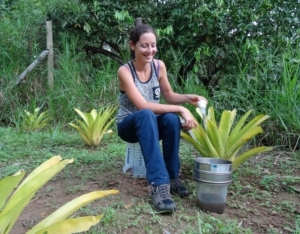 Camille will use tank bromeliads along with their associated aquatic invertebrates as model ecosystems. Tank bromeliads are neotropical plants. Their interlocking leaves form rosettes that collect rainwater and dead leaves from the overhanging trees, creating an aquatic habitat for various species of invertebrates. In the field experiment, bromeliads will receive either few or high quantities of leaf litter inputs. After a natural colonisation and equilibration period, the diversity and composition of the aquatic invertebrate community that colonised the bromeliads will be assessed and compared to the quantity of subsidised resources. The bromeliad micro-ecosystems will then be submitted to a drying and rewetting event, to assess their resistance and resilience. Camille hopes to show firstly that the variations in leaf litter provision will determine the composition and quality of the colonisation (including number of species, food chain length and overall community composition). Secondly, that the leaf litter quantity will affect the stability of the community submitted to drought, expecting the higher provision of leaf litter to give greater support, by offering a “buffering” effect to the community. It is hoped to show that leaf litter will provide short term refuges for invertebrates and be more attractive for recolonisation after the drought. We look forward to seeing the result of Camille’s research. 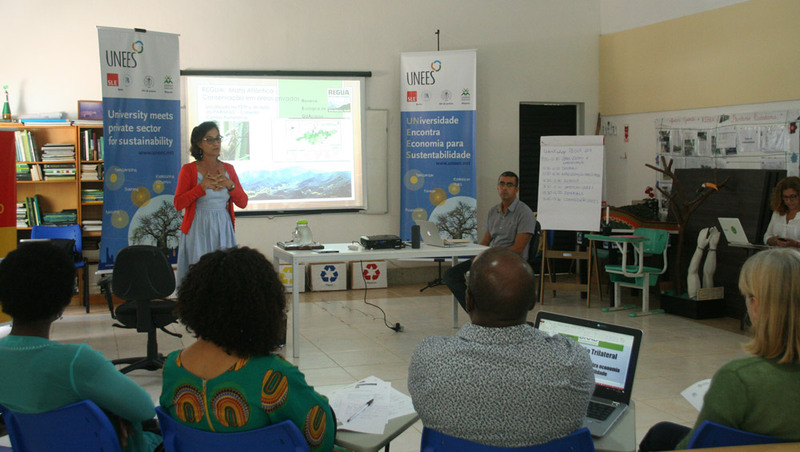 From 22-24 October REGUA hosted delegates from Brazil, Mozambique and Germany for the UNEES conference (University meets Private Sector for Sustainability). The project, led by Prof. Dr Leandro Fontoura of the Federal Rural University of Rio de Janeiro links the teaching and research activities of the three participating universities with sustainable actors from the private sector, creating a knowledge transfer channel in the field of rural development (in particular issues such as natural resource degradation and food insecurity). 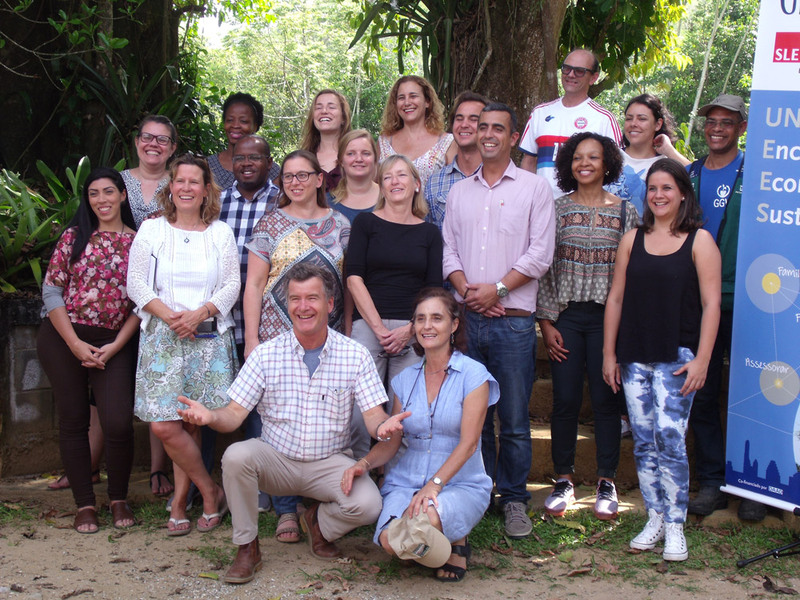 the MA programme “Sustainable Development Practice” at the Federal Rural University of Rio de Janeiro, Brazil (UFRRJ). Universities contribute action and development research to help solve the problems encountered by businesses. Businesses offer internships to students on Rural Development courses to enable students to help solve challenges and understand what the private sector needs. Universities improve their courses by incorporating practical examples from their business partners and businesses contribute guest lectures as appropriate. In Day 1 of the workshop at REGUA we heard from a range of existing partners. First up was Robson of the Comunidade Rural do Bonfim, (about 3000 people) near Petropolis in Brazil. In 1984 the Brazilian government made the whole area, including their land, into a national park, meaning that traditional activities of farming were no longer permitted. 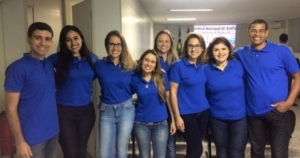 They are in the process of transitioning to be able to offer Eco Tourism to visitors and they have students from UFRRJ on placement with them to help research and plan. Next up was Hanna from Frankenforder Forschungsgesellschaft in Berlin, a private research company working in the area of agriculture and nutrition. Hannah had recently hosted an intern from UFRRJ (Brazil) to help solve various business challenges. For example, the intern helped a local asparagus company turn the parts of the asparagus that weren’t eaten into something useful, for instance a form of packaging, or a grain that could be added to bread to increase the nutritional value. The Mozambique team, made up of professors from a leading university in the country, contributed a very interesting presentation on their partnership with a National Park, a bank and a local solar power business. Potential new partners also had their opportunity to present – Katie Weintraub working at the Sinal do Vale regeneration centre near to Rio is a current student on the MA in “Sustainable Development Practice” at UFRRJ. She showed a great video showcasing their hospitality services and sustainability projects around forest restoration, organic agriculture, and community development. One highlight was a bioconstruction project where local youth and international architects worked together to create a “marquee” space to host events (and bring in income to help the centre become self-supporting) – the final product was an amazing octagonal space made with recycled toothpaste tubes, a material which had the added benefit of keeping the interior cool. The final slot went to Francine from “Articulacao entre chefs e Agricultre” using the CSA method – Comunidade que sustenta a Agricultura. Francine, originally a chef, set up the business to ensure that local producers got a good price for their crops and that food was used by restaurants as close as possible to where it was grown for maximum freshness and sustainability. In between sessions, the delegates enjoyed exploring the grounds at REGUA and catching some good sightings of both Brazilian Tapir and Capybara! 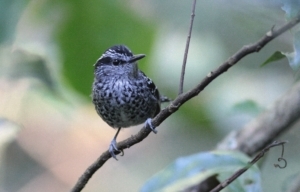 Scaled Antbird ( (Drymophila squamata) is a superb Atlantic Rainforest endemic species that can be seen along most mid elevation trails at REGUA making its plaintive call and hopping from branch to branch in the low vegetation. In spite of its the male having monochrome colours the visual effect it creates as it hops in the undergrowth is startling, indeed the female, who shares similar patterning, but with dark brown buff and hints of cinnamon is equally attractive. They can often be found feeding in pairs or small family groups as they search for insects and spiders in the forest. Our guests can be sure to gasp in appreciation – REGUA bird guide Adilie Carvalho da Cunha recently took this photograph. Although its status is classed of ‘least concern’ as it is fairly common throughout its range, having protected areas such as REGUA are vital to ensure its continued healthy population. We shall keep our eyes on them!! The Moustached Wren (Pheugopedius genibarbis) is quite a common Troglodyte here at REGUA especially around the wetlands. A largish bird with unmistakeable black and white facial stripes, rufousy coloured back and wings, creamy under parts and the characteristic banded tail, it can be found in low undergrowth with its musical chirp feeding on insects. Adilei attracted this male out of the brush and they had their moment of recognition, a brief duet and off he was looking for his insects. Introducing the Guapiaçu Grande Vida Team for their second project at REGUA. Following the successful reforestation of 100 hectares of cattle pasture along the edge of the River Guapiaçu in 2013-15, the second project is now underway. This time a 60 hectare plot is being planted, on steep and highly eroded land along the road on the way to our Waldenoor Trail. Ever wonder what the loudest bird on Earth is? The outrageous Bare-throated Bellbird (Procnias nudicollis) is certainly a top contender! 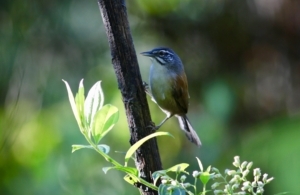 While hiking up the Green Trail here at REGUA, singing males can be heard from over a kilometre away. The call each male belts from his featherless blue-skinned throat sounds like a mallet striking an iron pipe, and echoes down the valley in rhythmic series. As we climb higher up the mountain trail, the boinks and bonks of competing males get louder and louder, but we can often only catch glimpses of them perched high in treetops. Today, volunteer bird guide Bobby found our lucky visitor group, front row seats to an ear-splitting performance by a young male singing close beneath the canopy. Bare-throated Bellbirds are endemic to the Atlantic Forest, found nowhere else on Earth. These large, fruit-loving passerines perform crucial seed dispersing services for many lowland and montane trees. Unfortunately, drastic logging of the Atlantic Forest for development, combined with illegal poaching for the caged-bird trade, has led to declining populations of this spectacular species and a Vulnerable designation by IUCN. But thanks to REGUA, the forest home of these contending males along the Green Trail is safe into the future. And they can return the favor by dispersing their favorite fruit trees throughout the reserve, helping the forest to grow! REGUA attended the second International Congress “Laudato si and large cities” organized by the Antonio Gaudi Foundation in Barcelona. 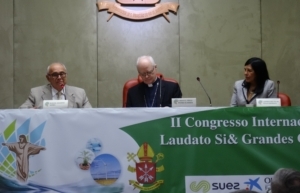 Pope Francis’s triumphal encyclical “Laudato si” or “Care for the Common Home” published in 2015 with the support of 1,000 scientists is, according to many, the greatest Manifesto on environmental concerns regarding planet Earth. It is an appeal for reflections and dialogue to every person on how we are shaping our world. In this second Congress, guest speakers presented their views and experiences on key issues facing an increasingly burgeoning population of which 80% of us live in cities. The topics continue to be of great relevance; water supply, atmospheric pollution and waste management. The issues are common around the world but the consequences are increasingly dramatic. The four day Congress showed that many share preoccupations and provided glimpses of successful solutions. Our delegates returned to REGUA with renewed enthusiasm and commitment to continue the work already started.